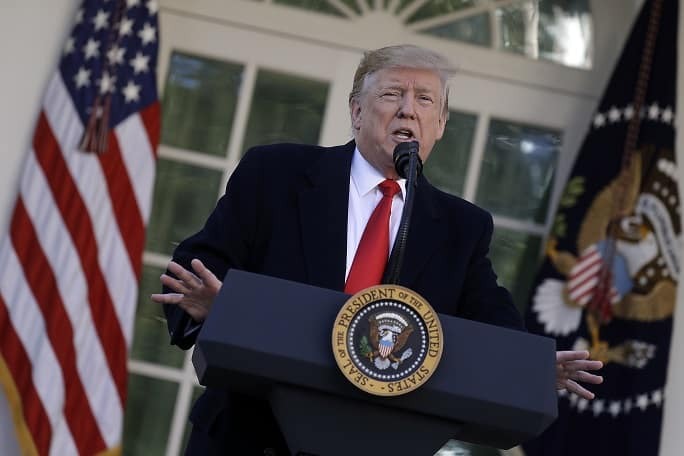 WASHINGTON (AP) — Yielding to mounting pressure and growing disruption, President Donald Trump and congressional leaders on Friday reached a short-term deal to reopen the government for three weeks while negotiations continue over the president’s demands for money to build his long-promised wall at the U.S.-Mexico border. Trump announced the agreement to break the 35-day impasse as intensifying delays at the nation’s airports and widespread disruptions brought new urgency to efforts to resolve the standoff. “I am very proud to announce today that we have reached a deal to end the shutdown and reopen the federal government,” he said from the Rose Garden. But he hinted that he was still considering taking unilateral action if efforts to come up with money for his wall fail. “I have a very powerful alternative, but I didn’t want to use it at this time,” he said. Senators were talking with increased urgency after Thursday’s defeat of competing proposals from Trump and the Democrats. The bipartisan talks provided a glimmer of hope that some agreement could be reached to halt the longest-ever closure of federal agencies, at least temporarily. At the White House Thursday, Trump told reporters he’d support “a reasonable agreement” to reopen the government. He suggested he’d also want a “prorated down payment” for his long-sought border wall with Mexico but didn’t describe the term. He said he has “other alternatives” for getting wall money, an apparent reference to his disputed claim that he could declare a national emergency and fund the wall’s construction using other programs in the federal budget. In an embarrassment to Trump, a Democratic proposal to end the shutdown got two more votes in the Senate on Thursday than a GOP plan, even though Republicans control the chamber 53-47. Six Republicans backed the Democratic plan, including freshman Sen. Mitt Romney, R-Utah, who’s clashed periodically with the president. The Senate first rejected a Republican plan reopening the government through September and giving Trump the $5.7 billion he’s demanded for building segments of that wall, a project that he’d long promised Mexico would finance. The 50-47 vote for the measure fell 10 shy of the 60 votes needed to succeed.